When director and choreographer Arthur Pita appeared before the audience at the opening night of Stepmother/Stepfather's UK tour in Birmingham, he revealed that he gave the dancers these three words to focus on before going on stage - "thrill, excite and disturb". So with trepidation, I embarked on seeing this latest double bill he has created in partnership with HeadSpace Dance - Stepmother/Stepfather - that is made up of two short productions on similar themes exploring gruesome and Gothic folk lore. It tours on to London, Salford, Bournemouth, Canterbury and Newcastle until May. I was particularly excited at Pita's return to Birmingham's DanceXchange at the Patrick Centre (within Birmingham Hippodrome) as his stunning version of fairytale The Little Match Girl is one of my favourite modern dance productions. He's one of the best choreographers of his generation in creating an emotional narrative, yet always with a dark twist. Keeping with fairytales, Pita's opening dance, Stepmother, is a macabre dark journey through snapshots of various children's stories like Snow White, Hansel and Gretel and Rapunzel while focussing on the abuse by various wicked stepmothers. 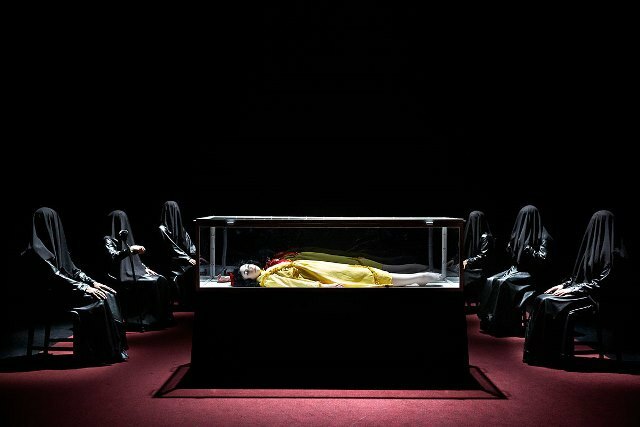 The cheerful music from Snow White plays while the audience take their seats and a childlike Snow White lies in a glass coffin on stage. It lures you into a false sense of hearts and flowers as it's clear from the first few minutes that this is not the kind of tale with a happy ending. Choral music of Requiem plays while the stepmothers, all in long black leather coats and huge enhanced purple lips, contort and twist in a sinister line-up. The wonderful Corey Claire Annand, who starred as the Little Match Girl, this time plays the ingenue, who is the poor victim in each section. She's an expressive dancer, in her movements and facial expressions, who gains your heartfelt sympathy. Snow White starts and ends Stepmother as the piece comes full circle. The sections are not all totally grim as Pita has carefully pieced together choreography with different qualities that manage to get to the root of the characters' motivations. Cinderella's stepmother has a disturbing, intense and manipulative air as she dances over the floor-scrubbing Cinders to control her; moving between kindness and hatred like the flick of a switch. Snow White's stepmother is seeking to return to her youth at all costs and dancing in near nakedness and killer heels, the anguish of lost youth is starkly apparent. Meanwhile Rapunzel and her keeper have a strangely tender relationship with petite Annand depicted in her tower by standing on a chair. Despite Hansel and Gretel suffering the most screamish fate of having their eyes pulled out and gobbled up, this is the most humorous of the sections with an edge of delicious black comedy. There's also a twisted sense of humour when dancer Annand reduces herself down to the size of toddler in a Victorian dress and has body parts sliced off and extracted by a gothic pair of twins. Horror fans will love this mix of Saw meets The Shining. Visually it's unique and strikingly memorable, despite the unease it creates. Little Red Riding Hood and the wolf are tame in comparison and some welcome light relief, yet still a visual statement of Annand in shiny red hoodie jacket streetdancing with the wolf. Pita's work is stronger for the excellent team of dancers he has selected and dancing the "stepmothers" are Christopher Akrill, Valentina Golfieri, Clemmie Sveaas, Karl Fagerlund Brekke, Nadia Adame and Nathan Goodman. There's a nice touch of continuity too when a barren woman desperate for a child steals triplets, who grow up to be the family that feature in the second production, Stepfather. While Stepmother is sinister, Stepfather lunges even further into the depths of macabre but is much more thought-provoking and unsettling. This was actually Pita's earlier piece of work that he first created in 2007 for CandCo and has since modified. It is inspired by and uses a folk punk track by Violent Femmes called Country Death Song that is based around the horrific murder of a girl by her stepfather after an incestuous relationship. He then goes on to kill himself. It dances out the story first of all and then replays it through the eyes of the killer and into death where he hopes for redemption. There's a Twin Peaks feel to it as the killer's soul slides out at various times to dance powerful duo scenes that signify a man wrestling with an inner turmoil. Karl Fagerlund Brekke as the Stepfather and Nathan Goodman as his dead self are both excellent and bring a haunting unease to the stage. Combining genres of country dancing, sensual ballet and even aerial work as there's a distinctive, unforgettable dance based around and on a hanged man - something I never thought I'd ever see. Clemmie Sveaas as daughter Mary Lou is exceptional too. While it may be a hideous storyline that clearly pushes the boundaries, it's also a disturbingly hypnotic production too and you simply can't tear your eyes away. What I love about Pita is that he creates scenes and imagery on stage that don't come close to anything I have seen before. His unique creativity is unwaivering. While Stepmother/Stepfather is more uncomfortable viewing than The Little Match Girl, it's no less creative and clever. It's distinctive and unforgettable for its gruesomeness but also its genius. Stepmother/Stepfather is recommended as suitable for ages 14 as it contains scenes of violence and some adult language. Visit the Headspace Dance website for tour details and tickets, which cost from £12.